We specialize in building MOBILE WOOD FIRED PIZZA OVENS ☟ ☟ ☟. Our ovens are based on the innovative design by Dave Sclarow of Pizza Moto. We train every customer on how to use them as well as offer guidance and instructions for free with your purchase! Our team is made up of a baker and a metal smith in upstate New York. The mobile wood-fired oven featured above is the first one we ever built. We rolled it down to Austin, TX for its first season. This pizza oven was built on a 1984 military surplus trailer, and has since served at countless farmer's markets, weddings, street fairs and private parties throughout Austin, South Florida, New Jersey and the Hudson Valley, NY. Browse the other pages on this site to see our mobile pizza oven in action! One of the incredible advantages to owning a mobile pizza oven trailer are the low overhead costs - you're not paying high monthly rent for a storefront, and when you're not using your mobile pizza oven, you simply park it! This is a flexible business model that allows you to step away whenever you wish. And when studies say that 94% of Americans eat pizza, you know you're making a solid investment ! We custom build our mobile ovens with a 5' x 5' Firebrick Hearth on 10' single-axle trailers. WE ALSO OFFER CONSULTING FOR THOSE ALREADY IN THE MOBILE PIZZA CATERING INDUSTRY! Large 5' x 5' firebrick hearth that allows for baking up to 6 personal sized 10'' pies at a time. Double walled steel dome, insulated with 6” of ceramic fiber blanket on all sides, and calcium silicate insulation blocks underneath the brick hearth. 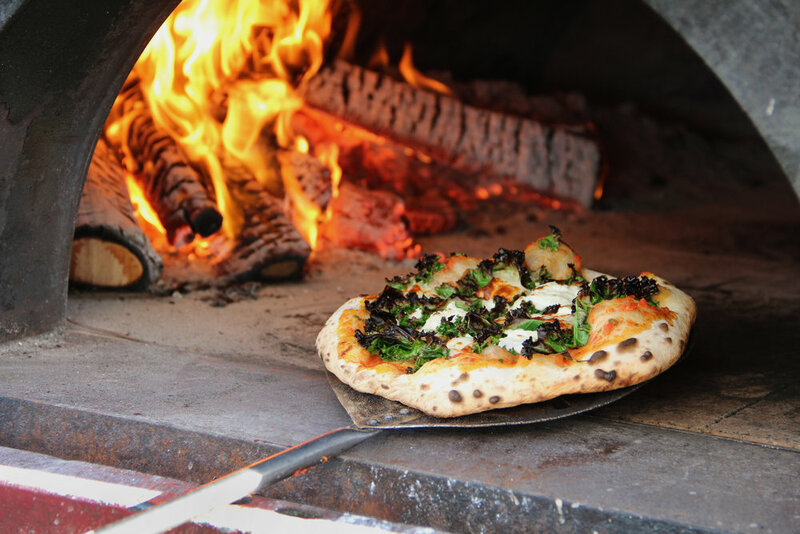 Unlike clay or brick ovens, our mobile pizza oven trailers can withstand the rigors of life on the road. Our insulated metal wood-fired pizza oven is significantly lighter and easier to tow than a full brick dome oven, and won't crack like a clay oven. Large storage space for tables, peels, and other pizza tools right under the oven (see below photo). Approximately 4500 lbs total weight. Recommended towing vehicle is an F-250, Dodge Ram 2500 or any vehicle with equal hauling capacity. Handles easily on the highway. Takes 4.5 hours to reach a working temperature of 800 degrees and full heat saturation of floor and walls. Performs excellently and at a lower cost than a full masonry oven. Perfect for events where space is limited. Built and welded onto a brand new single-axle trailer with a pintle hitch and electric brakes. We also include training and instructions on how to use your new mobile wood-fired pizza oven plus best practices for maintaining it over the years at no additional charge! This is a complimentary one-on-one training! We want to see you succeed in your new business. Scroll Craigslist and you'll find a plethora of mobile pizza trucks for sale, starting at around $30k. However, these food trucks feature relatively small ovens inside a full mobile kitchen, which frankly isn't necessary for wood-fired pizza catering. They're also expensive to transport. The advantage of our setup is that the entire trailer is a dedicated oven with a large working hearth that measures 5' x 5'. Personally I am much happier working outside under a shaded pop-up tent (as shown in the photo below) for the various weddings, events and markets that I cater, and I wouldn't want to be stuck in a metal box with a super hot oven! My approach has been to prep the dough and sauces beforehand, then shape, top and bake the pies on site. This is a much simpler and less expensive approach than a full kitchen on wheels, which simply isn't necessary. There's also plenty of storage on the trailer right under the oven. There we store our folding tables, peels, and other pizza-making tools. No Health Department has ever complained about our folding table set-up or the simple water bucket with a spigot that we use for hand washing! We prefer to keep it simple. We also converted our pickup truck to run on waste vegetable oil (with a kit from greasecar.com) so it's even more sustainable and cost effective. We build everything ourselves and don’t subcontract to others, so you can be sure that our pizza ovens are of the highest quality and are competitively priced. From the time the downpayment is received, your oven will be completed in 3-4 months time. Pickup is in Ulster County, New York. We can also arrange delivery for an additional charge. If you have any questions or are interested in purchasing your own mobile wood fired pizza oven, use the form below to contact us! Thank you for your inquiry! Doug will follow up with more detailed information ASAP.